Facebook is no more a chat platform, with time and technology it has evolved as a social giant giving fun moments to chat, engage with friends, promote business, launch new products & market your brand to the millions of users in a single mouse click. Don’t waste your time & money after useless facebook business page design that everyone shouts of and has nothing to offer. Check out the tips that can be helpful in designing a Custom Facebook Fan Page Design. 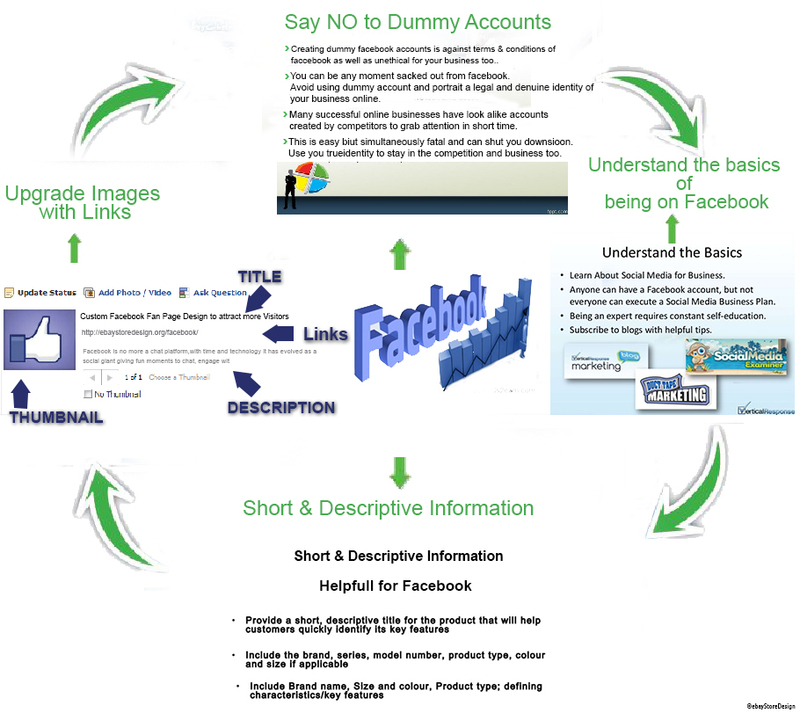 Creating dummy facebook accounts is against terms & conditions of facebook as well as unethical for your business too. You can be any moment sacked out from facebook. Avoid using dummy account and portrait a legal and genuine identity of your business online. Many successful online businesses have look alike accounts created by competitors to grab attention in short time. This is easy but simultaneously fatal and can shut you down soon. Use you true identity, to stay in the competition and business too. Profile pictures, cover photos, post, likes etc. are very things that you come across when you are on facebook. Out of it profile & cover photos are very essential. Let see them. Select an easily recognizable profile pic for your FB business page. It can be a logo, if you are operating as a company or firm and if you are operating solely it can be a personal image. It is very important to be found and liked through images when anyone does graphic search. Next is the cover photo that gets maximum space on your facebook business page design and has maximum potentiality to promote, get identified easily & engage viewers more than any other thing. The cover image shall be in the most appealing manner so that it lures the visitors’ retina and more over make them stay on your page for a long time. You get plenty of opportunities to redirect your viewers from you facebook page towards your webstore. You can even link a single page like about us or contact us to the images on your facebook pages. These links direct interested visitors towards knowing more about your company. Also do keep these links in short forms when you plan to add them to images. After all the visual gigs it’s time to have a good hand on describing yourself. Write short information in the “about” section that lies exactly under the cover image. This information is valuable for those visitors who scan your page and wants to know more. Keep it short; avoid too many details so that visitors tend to click the link that will direct him/her to your main store. Following these simple tips you can attract & engage more visitors on your facebook business page. Keep reading the blog for more on this series. There are certain circumstances when you may not require a template for your online store. It completely depends on the products, buyers & demand whether you need one or not. Though whatever the situation be, it is highly recommended to have design templates so that you can perform better and get sufficient returns from investments. Here we will discuss various “I don’t need a custom eBay auction template” conditions and probable effects of not having one. There are products & categories that fall under terms like artifacts, rare, similar, less usage and many more to evaluate the use of product that a buyer is buying. Let’s understand it with an example, say you are an art collector and having rare artifacts that you have listed on your auction template for art lovers. You have single pieces of each artifact; hence you can sell them without templates, because you don’t need to create complex category or campaign to sell them like other products. Selling something that is rare and unique accompanies good price along with its own debacle like: Limited buyers, uncertain buying chances (they may or may not buy), less recognition of products & brand, low grade store quality (no designer templates) and much more. Hence when you sell single items it is very difficult to establish visitors to your store and even more difficult when you don’t use templates. Everybody likes having less or no competition situation. The entire buzz is to stay on top of all competition; sellers try hard to promote and sell their items by all means. But when you know that competition do not exist you get relaxed and care less for things that are a matter of survival for others online. Less demand of the product might be probable reason for less competition out of several factors responsible for minimum competition. If it is so then demand shall affect sales figures and might tend to shut down your store ultimately affecting the revenue. Sometimes competition is good for your business health. Budget is the main constrain of every business. Here budget problem is addressed to low budget. Having low budget is not a big issue, but when you have only 50 to 100 dollar for setting up a store, the listing fee will itself consume all these. So, £50 or £100 doesn’t make a fair budget, at least you need to have a few hundred dollars to start up an eBay store so that you can sustain a long time even if there are no sales. A few hundred dollars can kick start your business but to keep sales incoming you need to invest a little more in beautification of the store to attract buyers, which is possible through a designer template. We saw that small budget has its own pros & cons. Hence, we discussed certain exceptions where you may not need a template, but simultaneously we also referred the negative impacts of the same. Even though with all the above situations some basic designing services are suggested to get started with fair amount of sales to fetch initial investments made. Contact us for more information on our designer services. 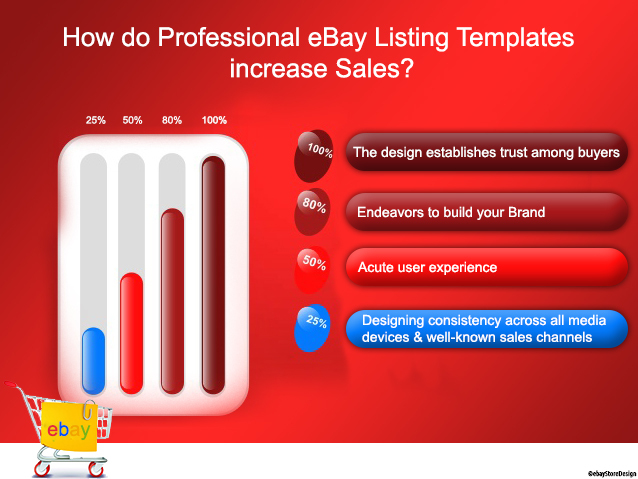 How do Professional eBay Listing Templates increase Sales? eBayStoreDesign is an online eBay store designing connoisseur creating excellent eBay Listing Templates for emerging & established businesses since 10 years. With a wide client base and tons of template designs till date, we have emerged as experienced designers to increase sales for sure. How do our eBay Listing Templates boost Sales? There are many factors responsible to influence sales, ultimately depending upon what type of products you are offering to your customers. eBay is a huge eCommerce market that guarantees both buyer & seller regarding, payments, delivery, products, etc. eBay follows strict return & refund policy in case of disputes arising between buyer & seller. Our professional eBay Listing Templates differentiate genuine seller from amateur ones. These designer templates assure buyer that their money is safe & that they are at right place. Trust is important to reinstate buyer’s confidence and so our designs do. Branding is an art. An excellent design used to build brands must create that feelings & luxury associated with products that your offer. A thorough uniformity shall be maintained across product listings & storefronts, to make the buyer feel comfortable. The comfort of digging out desired product will crave the buyer to search more and more. A rational display of product attracts anyone – whether you are on a virtual store or at a real time shop. It is because it makes your selection fast & easy. Product Image, Description, Title, shipping & delivery terms are the most sorted information by any buyer while shopping online. Our designs do the best in these areas. Also if there are any cross link ups given for the product the chances of buying a product is doubled. Remember buyers are smart and always keeps a substitute in their shopping cart, if it’s not you than it can be somebody else. As mentioned above stability in the design shall be there, whether viewed on desktop, laptop or touch devices. We, at eBayStoreDesign have developed our designs to make the buyer feel familiar immaterial of screen size or sales channels. Sales increases through genuineness, tell your buyer about every possible thing which is viable for them to know when they make a deal. eBay gives you same default Prehistoric Look – What about an Advance Custom eBay Store Design? There are 1000s of online designing companies offering custom made templates or ready to use templates for eBay. Obviously custom made are highly advance with compatible features and ready use are equally advance but short of features. Now if we care so much of these features then let me ask you what they are. What features shall an advance custom eBay store design posses? Ok let us discuss all the - what & what not’s. The design should be applied not only to the home page but to all store pages that are to be visited by your buyer. Designing few pages with a decorative home page due to what so ever reason will have negative impression. Give equal importance to all pages. Your store design shall comprise of a standalone header design, so that the visitor gets a brief idea about product being sold. The header should be appealing enough to the buyer. Logo with an easy to remember tagline lays more impact on visitors and has the potentiality to convert visitors into buyers. But both must be a visual masterpiece. Internal links placed on home page or other pages should divert visitors gracefully and his/her intention to click a link must be fulfilled. Any website or template design without a search box is incomplete and stands nowhere. Custom design must have search facility by product name, category, subcategory, type, size etc. Be it your home page banner or your products, image play an important role. Many designers give 4, 6 or 9 box space to place product images with a brief product info. This facilitates visitors the most. Custom designs include beautiful banner images with crispy write ups. These tactics always works. An ideal custom design shall have these features. Home page is the gateway of your store, but pages like about us, shipping, payments, returns, contacts us are equally important depending on the nature of the business and clients mindset regarding additional pages. They may differ. Generally charts and tables are used if you are selling consumer goods. Custom design displays size information country wise in eBay listing & store design. Few of them go for distinct ways to display their goods other than charts & tables, but designing it may cost them. Contact us, newsletter subscription, sign in, sign up, social media links and others that are frequently used. Custom designs have special slots for these links. They are animated or place in a colorful background to divert visitor’s attention on them. This feature is of utmost importance. The whole idea of online business is based on these techniques. In a custom store design the HTML codes are optimized to rank higher in search engines. These customized and SEO friendly designs tend to sell more than regular designs. Opening an eBay shop is just few clicks work but bespoke custom eBay shop requires expert designing skills. To be successful online you should have unique product line, timely shipping & competitive customer service policy, smart price tags and a strong customer base. All these ingredients are enough to give you more than average business. The word “design” is not mentioned in the above list. Today eBay design stores online has become crucial. Custom eBay shop design or an eBay listing design is as important as your product line. Technology has its own pros and cons. Let us see what they are. When you open an eBay store you get default store design which eBay gives to all its sellers. It is basic and simple. There are loads of designing companies across globe delivering custom eBay shop design at a very low cost. They are worth trying once. Along with customized designs readymade templates are also available with these designers. Just purchase them, pay for it, install & start selling. It is as simple as this but there is a vast difference of quality & performance between custom and ready built designs. Beauty always attracts viewers. These designs enrich the shopping extravaganza of the buyers. These template designs can also be merged with old ones. There are auto update features in the new designs to do this. Hence, no manual updating of old ones. An increase or decrease in the sales is impacted by several factors; these new designs have the tendency to increase you sales. But How? The awesomeness of these design lies here with enhanced image gallery, dynamic category & menus. All this not only lures buyers but also facilitates the comfort of shopping online. Moreover customizing your store according to customer’s preferences will well converse with the customers and give you idea to analyze more about on what your buyer need. These template designs increases your conversion rate with the buyers. These designs have much more to offer you like custom eBay pages, custom search box, flash banners, and promotional banner with sliding images. The designers also provide 24 x 7 ongoing online technical supports for installation. If you are not well versed with technical knowledge they assist you by providing step by step guide on the problems. In this way custom made templates work at your ease and level. If search online you will find that many successful stores on eBay has distinct sets of custom eBay shop fronts. It is not possible to predict a buyer’s mind. To stay ahead of your competitors you need to have these designs on your stores. Do before someone else does it.